GM President Reuss at Flint Assembly with 2020 Chevy Silverado 2500HD. The Silverado HD’s 6.6L turbodiesel V-8 makes 445 hp and 910 lb.-ft. of torque, which is unchanged from the previous-generation truck. But it hooks to an all-new Allison 10-speed automatic transmission for a 52% increase in maximum towing capacity to 35,500 lbs. 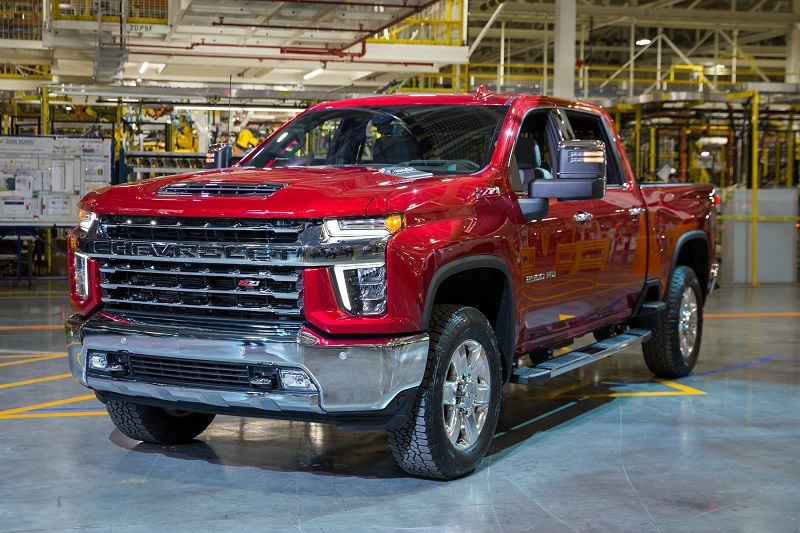 FLINT, MI – Americans are hog wild for trucks these days and General Motors puts more pork on the table with the sheet-metal reveal and early-production launch of the redesigned 2020 Chevrolet Silverado 2500HD and 3500HD pickups. The Silverado heavy duties are big brothers to the light-duty Silverado, which was redesigned for ’19 and began arriving at Chevy dealers late last year. The Silverado HD begins arriving at U.S. dealers this summer, alongside the GMC Sierra 2500HD and 3500HD. It also comes as key competitors Ford and FCA US are launching redesigned models of their heavy-duty pickups. GM showed journalists a mock-up of the new Silverado HD last year. The reveal here was a first look at the truck in the flesh, as well as the start of pre-production models. It is unquestionably the year of the truck in a market where more than 70% consumers are buying either a pickup, SUV or crossover, and automakers are there to meet them with products boasting new levels of capability, refinement, connectivity and fuel efficiency. The trucks also are fueling automaker coffers, giving them cash they need to keep shareholders happy and fund a business rapidly adding new forms of mobility. But in a segment historically known for specifications wars, especially which manufacturer’s heavy duty has the most pulling power, GM President Mark Reuss argues these days it is more about combining capability with refinement than offering raw muscle. “This is what our customers demand in this segment. They work with these trucks, and that’s what we provide them,” Reuss tells Wards after showing off the new Silverado HD on the floor of its Flint, MI, assembly plant north of Detroit. The Silverado HD’s 6.6L turbodiesel V-8 makes 445 hp and 910 lb.-ft. (1,243 Nm) of torque, which is unchanged from the previous generation and short of the 1,000 lb.-ft. (1,355 Nm) generated by the Ram 2500HD with its Cummins 6.7L High Output turbodiesel inline 6-cyl. But GM hooks the Silverado HD to an all-new Allison 10-speed automatic transmission, which together with upgraded parts such as larger and stronger front and rear axles; larger ring gears to both 2500HD (11.5-in. [292 mm]) and 3500HD (12-in. [305 mm]) models; and 30%-larger prop shafts helps enable a 52% increase in maximum towing capacity to 35,500 lbs. (15,876 kg). The Ram HD’s tow rating is 35,100 lbs. (15,921 kg). Other Silverado HD upgrades include a stronger frame, which delivers a higher gross combined vehicle weight rating of up to 43,500 lbs. (19,731 kg). A 28-in. (711-mm) diameter variable speed fan, which is 2.5 ins. (64 mm) larger than the one it replaces, will help keep the turbodiesel cool under all that load. Silverado HD High Country interior. The new Silverado HD also will offer an all-new 6.6L gasoline V-8 mated to a 6-speed automatic transmission. The engine is based on the small-block architecture of the 6.2L and 5.3L V-8sin the light-duty Silverado. It replaces the 6.0L V-8 of the previous-generation Silverado HD and makes 401 hp with 22% more torque to 464 lb.-ft. (629 Nm). A longer stroke gives the iron-block engine 18% greater towing capability to a maximum 16,800 lbs. (7,620 kg). Other highlights include an Autotrac active 2-speed transfer case on 4-wheel-drive models electronically controlling a “4-auto” mode to seamlessly shift between 2-wheel and 4-wheel drive, depending on the road conditions; an exterior design with greater differentiation from light-duty models; and exterior dimensions that are wider, taller and longer than the outgoing model for increased cabin roominess. No more engine-block heater cords hanging from the grille, either. A block-heater outlet has been integrated into the driver’s-side front bumper. The filler for the diesel exhaust fluid tank has been moved into the fuel filler panel; a new snow plow prep package was engineered for easier upfitting; and exterior mirrors have an available power-in/power-out capability for enhanced convenience. The exterior mirrors are mounted lower for better forward visibility. The Silverado HD also carries over some new trailering technology from the light-duty model meant to make pulling safer and more convenient. For example, there are 15 available camera views with addition of an accessory camera to include high-definition surround vision and a unique transparent trailer feature that takes the trailer out of the picture to see surrounding obstacles. A new side-view perspective helps drivers negotiate tight corners. Jaclyn McQuaid, chief engineer-Silverado HD, says the trailering technology will be a key selling point, and she does not consider it technology for technology’s sake. Flint Assembly is GM’s oldest assembly plant, dating back to 1947. But the facility has undergone $1.5 billion in renovations since 2011, expanding its footprint to 6 million sq.-ft. (557,418 sq.-m) from 3.7 million sq.-ft. (343,741 sq.-m) with an all-new body shop, state-of-the-art paint shop and a new trim shop. It has produced 13 million vehicles over its lifetime, including the first 300 hand-built units of the Chevy Corvette in 1953. Its current capacity is 250,000 trucks annually, or one unit every 90 seconds.